The AMNH had the only SRG Dinosaur Toys in the city. 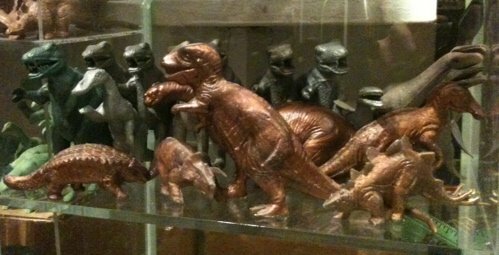 The AMNH carried the full line of SRG (Sell Rite Gifts) metal Dinosaurs. It was the best toy store in the world. 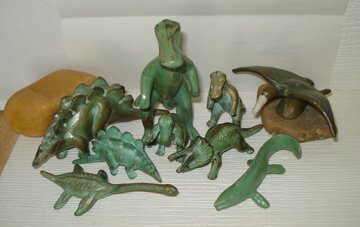 The AMNH (The American Museum of Natural History in New York) sold the SRG series of metal Dinosaur toys in its gift shops from the late 1940s to mid '50s. I think the small ones sold for $1.00 and the big ones for $3.00. I had no idea how much a dollar was worth at the time. They were introduced in 1947 and continued in production for the next eight years by Sell Rite Gifts. In 1955 the molds were sold to a company in Japan, Abbeon. The molds remained in use producing ceramic and plastic models until the 1980s. But in 1951 my six year old imagination was fired with images of herds of metal Triceratops and Trachodons crossing the floor of my room, stalked by Tyrannosaurs, both large and small. The Tarzan comics of the time had a story line about a lost tribe in a lost world that rode Triceratops and I wanted my toy cowboys and Indians to have the same mode of transportation. My regular trips to the AMNH garnered me a fair number of these SRG figures, both large and small. Each Dinosaur toy figure came with a small information card, with the name of the Dinosaur, a line drawing of it and a short blurb describing what it did- "swam around" "ate shrubs" "ate other Dinosaurs" whatever - and when it lived- the Permian, Jurassic or Cretaceous Period. Those cards are great collectibles in their own right today. I learned a few things about "economics" as well on my monthly trips to the AMNH Museum Shop. If I got the small figures, which were less expensive, I could get three, four or even five per visit. If I got the large, I could never get more than two. I also learned that these were a lot more fragile than being metal might suggest. The figures themselves had very little detail. They were really more artists conceptions, not fully formed. Neither realistic nor sur-realistic they left a lot to the imagination. Being a young boy I had plenty of that to spare. The Brontosaurus is perhaps the least detailed and most fluid. The Stegosaurus, perhaps, comes closest to conveying a sense of the actual Dinosaur along with a feeling of movement. It is my favorite as these have ceased being Dinosaur toys and taken on being Dinosaur treasures. Breakage became a major issue for me. I preferred the T-Rex, Triceratops and Dimetrodon but each had a unique problem. The arms of the large T-Rex tended to break off when he attacked other animals. The Triceratops' horns would break off in defense and the Dimetrodon's tail was always breaking for no reason at all. Honest. Each creature had its own unique breaking points and my six, seven, eight and nine year old hands were just too rough for these to prove out as truly play-with-able toys. (A role they were not created for.) But I tried. I really tried. My mother would occasionally request to see, then have one of my unbroken SRG Dinosaurs. I was regularly giving her broken pieces to try and cement back together... and who can deny a mother's request? Those that my mother kept were the only ones to survive my childhood intact. The SRG figures at the AMNH came in two sizes, large and small. The two castings were themselves different, if similar. The small wasn't a simple half-sized large but a unique figure unto itself. Eventually each of these will have a link to its own page and personal description and this sentence will disappear forever. Type "SRG" and the dinosaur name into the "Search" window and you can find photos here. By the mid-1950s most of my SRG Dinosaur toys were either lost, permanently hospitalized or in the care of my mother. Even as SRG sold their molds and ceased production in 1955 the wave of the future was making itself felt. Luckily for me (and children the world over) The Louis Marx and Company came along right at this moment in time (1955) with their nearly unbreakable and wide ranging line of inexpensive plastic Dinosaur toys. I was overjoyed. A new generation of Dinosaur Toys was in my grasp! What happened to the SRG Dinosaurs? They were originally sold in Museum Gift Shops (not toy stores, never toy stores) as souvenirs. I am sure other children discovered them just as I did and treated them no better. 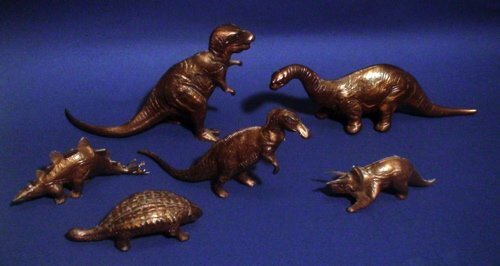 You may also find these original metal Dinosaur Toys at garage sales and flea markets as well as other auction sites on the web. Due to their fragility unbroken ones tend to go for premium prices. If they have their cards, for even more. They have migrated from toys to collectibles. He bought it himself at the AMNH gift shop and had kept it since then. ["chain of evidence"- ed.] I was quite taken. It resembled both the Sinclair & later DFC re-issues but I had never seen them in this coppery/bronze marbled/swirled color. The AMNH and SRG Dinosaurs got me through the era of the few and delicate Dinosaurs. Marx Toys took me the rest of the way. 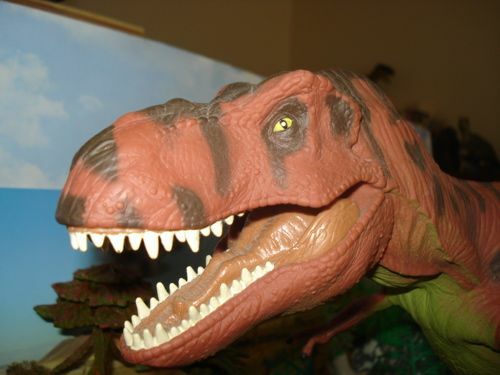 Want the list of dinosaurs made by other companies? Click Here!! Want to check out ALL the Dinosaur Toys? Go here to find them.